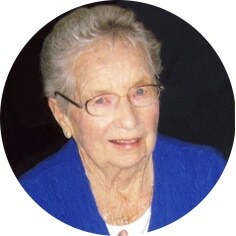 Hazel Fritzler, aged 95 years of Moose Jaw, SK passed away on Sunday, January 6th, 2019. Hazel was born in Broadview, SK. She married Albert Fritzler in Regina, SK and together they raised 4 children. Hazel will be remembered from her working years at the Uptown Café and Sears in Moose Jaw. She was predeceased by her husband, Albert; son, Robert; son-in-law, Harvey Biden; and all of her siblings. Hazel will be lovingly remembered by her children: Joanne (Gary) Finch, Donalda Biden, and Tim (Marlene); 9 grandchildren and 17 great-grandchildren. The family would like to thank the staff of Pioneer Lodge for the exceptional care and support given to Hazel and her family during her stay there. In keeping with Hazel’s wishes, a Private Family Service will be held at Rosedale Cemetery. Flowers are gratefully declined. As an expression of sympathy, donations in Hazel’s name may be made to The Moose Jaw Humane Society, Box 1658 Station Main, Moose Jaw, SK S6H 7K7. Arrangements are entrusted to Moose Jaw Funeral Home, 268 Mulberry Lane. Todd Sjoberg, Funeral Director 306-693-4550. Our deepest condolences on the passing of your beloved mom; your dedication to her is a testament of the wonderful mother she was. Cherish those memories. Donalda, and family so sorry for your loss please keep your fond memories close during this difficult time , Hazel always made me laugh she had such a great wit. To all the Fritzler family sorry for your loss. Aunt Hazel you made me smile and shake my head at the same time ha. My condolences to Hazel’s family. I have fond memories of growing up in Happy Valley, spending time in the beautiful Fritzler yard and the visits with Hazel she was quite the lady. May your memories bring you peace. Donalda and Tim and families, I was sad to see your mom had passed away. I got to know her at Mulberry and had many wonderful visits with her and friends in the Atrium. She was a wonderful person. You were blessed to have such a great mom. You will have so many great memories to help you in your time of sorrow. Hazel brought us so many memories, our daily visits to the Uptown Café when we worked at Sears are cherished for ever. What a sense of humor, even the days she spent at the Mulberry we would look forward to seeing her, and of course teasing wasn’t part of the conversation. THINKING OF HAZELS FAMILY IN THIS TIME OF SORROW, MAY YOUR MANY GOOD MEMORIES GIVE YOU STRENGTH FOR TOMORROW . SINCERE CONDOLENCES TO HER FAMILY. My condolences to the Fritzler family. I remember the good times that I had when I worked with Hazel at Sears in the 1970’s, she was so much fun. You will miss your Mom, Grandma and Great Grandma. Our sincere sympathy in your loss of Hazel. We have fond memories of her. My deepest condolences Donalda and family, Hazel was a wonderful person, and she will be dearly missed. I called her Hazelnut, and she let me. We had many laughs together and I will miss her. My sincere sympathy Donalda and Family. Dear Tim and Marlene . Just heard about your lose. Our are thoughts are with you in this time of sorrow. May time heal your grief. Joanne, Donalda and Tim I am so sorry to hear that your mother passed away. I remember her amazing chicken recipe and also the days when I used to curl and set her hair. Condolences to all of you from Marjorie (Hirst) Keenan and family. Please accept our sincere condolences on the passing of your dear mom. She was a lovely lady and one of our fondest memories was chatting with her at the Uptown cafe while enjoying a cherry coke after school so many years ago. Know that others are thinking of you at this difficult time. May she Rest In Peace.